Shoukat Ali top scored with 48 as Scholes inflicted an 87-run defeat on promotion rivals Wrenthorpe as they retunred to the top of Allrounder Bradford League Championship One. Pictures: Paul Butterfield. Scholes took a huge step towards clinching promotion from the Allrounder Bradford League Championship One as they inflicted an 87-run win over rivals Wrenthorpe last Saturday. Scholes were given a further boost when Methley suffered a surprise defeat to Baildon allowing James Stansfield’s side to return to the top of the table. Scholes are now 11 points clear of Methley and 29 ahead of Wrenthorpe with five matches remaining. Shoukat Ali (48) and Akbar Badshah (44) made useful contributions to the Scholes total of 193-6, which saw James Glynn claim 3-22. Captain Greg Wood (34) top scored in Wrenthorpe’s disappointing total of 106 as Badshah capped a fine display by taking 3-17. Marcus Walmsley (52) and Muhammad Akhlaq (38) helped Methley to a total of 175 in the face of good bowling from Baildon’s veteran spinner Mushtaq Ahmed (4-32). 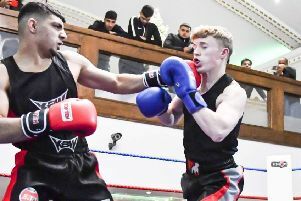 Jack Hainsworth (53) and Mounum Ejaz (41) steered Baildon to victory despite the efforts of Harry Sullivan (4-39) and Marcus Walmsley (3-44). Gomersal suffered an agonising one-wicket defeat to Bankfoot, who climbed out of the relegation zone. Former Cleckheaton man James Lee produced a match-winning performance as the Bankfoot captain took 4-59 as to help dismiss Gomersal for 152. Gomersal’s innings was dominated by captain Graham Hilton with a top score of 71, while Jawad Waheed gave Lee support with the ball as he picked up 3-32. Lee struck an unbeaten 51 to steer his side to victory as pressure mounted under spinner Chris Rhodes, who returned figures of 3-19 in 15 overs, and Joe Duffy (3-42). Opener Micky Hutchins (34) was Bankfoot’s second top scorer. Birstall are 20 points adrift at the bottom after a 79-run defeat by Yeadon. Ryan Heptinstall (50), Damon Gormley (32), Mohammad Saeed (31) and James Todd (31) helped Yeadon to 235-8, despite the efforts of Charlie Orme (4-54). Opener Craig Wood made a battling 57 and Orme (31) before Birstall were all out for 156. Paul Machell (4-39) and James Massheder (3-33) were the chief wicket takers. Morley replaced Undercliffe in fourth place after beating them by 144 runs. Morley captain Oliver Halliday struck six sixes and six fours in a top score of 67, while Colin Nuthall (30) supported in their total of 195, despite Undercliffe’s new ball bowlers Craig Wiseman (4-42) and Zeeshan Qasim (3-28) getting among the wickets. Matthew Dowse (6-25) and Nathan Bromby (4-25) bowled out Undercliffe for just 51. Bowling Old Lane dropped into the bottom two for the first time this season after suffering a 106-run defeat against Ossett. Khalid Usman (91), Paul Malone (79) and Wahab Mirza (39) powered Ossett to 247-7 a total Old Lane never looked like challenging as they were bowled out for 141 as Usman (3-23) and Malone (3-30) produced an impressive spell.